Among many other applications, this system allows real-time measurement of traffic flow in urban environments at different times of the day, the number of people in a group, or the people who come in and out a mall each day. The project has been implemented thanks to the collaboration of Granada's Mobility Area. Its main novelty it is small and non-intrusive, and easily installed in heavily trafficked areas. "We only need a place with electricity and an Internet connection to install the device, which is also much cheaper to manufacture than other similar devices that already exist in the market," says researcher María Isabel García Arenas. In the case of traffic measurement, the software designed at the UGR accurately monitors the number of vehicles passing near the traffic light where the device is located, based on the Wi-Fi and Bluetooth signals emitted by their cellphones. That way, the system counts how many cars per minute pass through that point and automatically sends this information to the Twitter account @mobywit to make it public. It can tell the user how long would it take to get from one point of the city to another, for example. 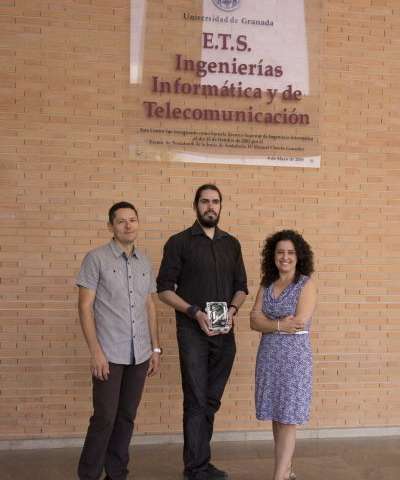 So far, researchers have tested this system at various traffic lights in the center of Granada to measure traffic, and at the entrances and exits of the Higher Technical School of Information Technology and Telecommunications Engineering of the University of Granada (ETSIIT, from its abbreviation in Spanish) for monitoring the number of students entering and leaving the school. "The possible applications for this new system are many and varied," says Pedro Castillo Valdivieso, another of the UGR researchers involved in the project. "For example, we can estimate how many people participate in a protest based on the signal of their cellphones, or how many people attend to a concert. We could also monitor the path that tourists follow in the center of a city, which is a greatly useful information for municipalities wishing to improve accessibility, for example, or to increase security through police officers or the installation of traffic lights."